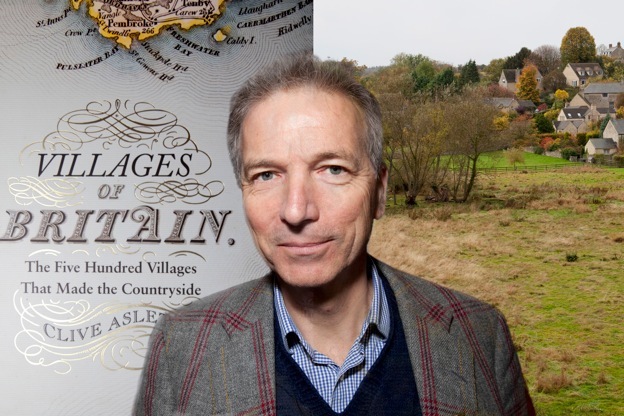 On a biting Arctic evening on December 3rd, Clive Aslet, editor-at-large of Country Life, made a heroic journey from Pimlico to give a fascinating and witty talk about some of the five hundred places he visited during research for his latest book, Villages of Britain. It reinforced the opinion of many that British villages and surrounding countryside are, without doubt, among some of the most interesting and attractive in the world. Clive's illustrations included a stone in one village marking the spot where an 18th Century pioneer-balloonist came to down to earth with a bump; the architectural geology of a village like Clovelly, in Devon; a view of Bibury cottages (which William Morris thought the most beautiful in the country); and map of strip-farming in the Nottinghamshire village of Laxton, where agriculture is still prominent, with 14 working-farms still going strong. There was also an illustration which showed that the iron-making industry had once flourished on the Sussex Weald, in contrast to its current bucolic image. Clive, who edited Country Life for 13 years, also read some amusing epitaphs, highlighted some fascinating symbolic pew-carvings and described a journey to Knoydart, in the north of Scotland, where a community has re-established itself wholesale in the remote countryside. Instead of the possible schisms, the village has evolved harmoniously and the residents - many of whom have several jobs - seem to be an object-lesson in how a village can work together and prosper. One of the key points to emerge from the hour-long talk was that the countryside has, in the past, been the scene of intense poverty and there are stories and illustrations of families starving to death when crops have failed. One anecdote featured a woman who crawled to the village pond with a kettle to fetch water - but died of hunger in the process and never made it home. Clive, a passionate campaigner on countryside issues, is a firm believer that (in general) in-comers can add enormously to village life and that second homes need not necessarily be a bad move - because there are many instances of these properties becoming first-homes in due course, when people retire into the countryside. At the same time, the properties have often been renovated and saved from decay. And what Clive's talk reminded us is that villages - whilst often seen as an image of timelessness, are actually in a constant state of flux and that some in East Anglia, have shrunk due to economic change over the centuries and that others, like one on Salisbury Plain, have simply been abandoned after the Army requisitioned them and their inhabitants moved out. We are very grateful to the 70 hardy people who braved the biting weather to attend Clive's talk and the profit from the evening was £416, giving a total of £12.339 after 23 talks.